The New Balance T1210 is the perfect shoe for light runners. Size11 B(M) US. Size 11 2E wide. white with purple pink and gray accents. Ready for a new owner! FantomFit is a skeletally engineered upper that provides ultra-light support and fit. Condition : New without box. You'll love it. New Balance Womens wx857wb2 Low Top Lace Up Walking Shoes Size 11 Never Worn! Great shoes were never worn. 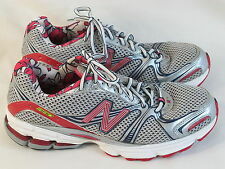 New Balance Women’s walking shoe size 11. New unused, no box. As always your satisfaction is our priority, we strive to provide exceptional service and appreciate your 5 star positive feedback. Please see our other items in eBay store Tidalwave collectibles, we specialize in all things pop culture. They are Sz 11 B. IT IS THAT SIMPLE. FURTHER IMAGE DISTORTION CAN BE CAUSED BY THINGS SUCH AS VARIATIONS IN MONITORS / VIEWING APPARATUS. I AM ONLY 1 PERSON! Up for grabs are a beautiful pair of shoes. WIDTH IS "B" OR REGULAR. THERES A TINY HOLE ON THE SIDE PADDING. ONE SHOE LACE IS A BIT FRAYED WITH A SMALL CUT IN IT. THEY GO CHEAP. FREE PRIORITY S&H IN THE U.S. This updated version features a sleek new upper with a dynamic eyerow, secure collar and tongue construction, and an aggressive aesthetic. Size11 B(M) US. New Balance is dedicated to helping athletes achieve their goals. It's why they don't design products to fit an image. They design them to fit. Size11 B(M) US. Excellent - Only slight signs of wear. Does not diminish the overall appearance of the item. New Balance. Running Shoes. Gray White Blue. Very Good - Well maintained. Shoes minor signs of wear that are consistent with light use. 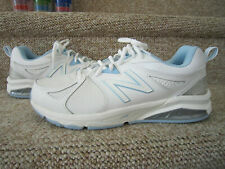 Brand new New Balance 1540v2 size 11 B women in white and blue. They retail for $165. Awesome deal from a pet and smoke free home. Happy shopping. NEW Wmn's SZ 11B, NEW BALANCE Fresh Foam Gobi Trail v2 WTGOBIF2 Viv Coral-Black. Condition is New with box. Shipped with USPS Priority Mail.